Driven by duty and honour, Raikoh, the famed undead warrior from Otogi: Myth of Demons, returns to the demon-infested city but this time he is not alone. Five masterful warriors battle alongside him with brilliant magic and unearthly powers to defeat the demons once and for all. 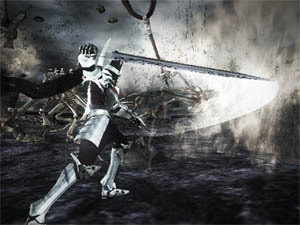 Sega's awesome undead tale returns in what promises to be one of the most exciting action/arcade games of 2005 that once again reunites players with the powerful Raikoh and his soul shrine sword which has the power to banish demons from this mortal realm. For the uninitiated, the original Otogi: Myth of Demons followed the tale of a resurrected ancient Samurai called Raikoh who is faced with ridding the Earth from the demonkind. The story is set during the Heian era of Japan (794 AD – 1185 AD) and closely follows a variety of ancient mythological characters and creatures from Japanese history to make this one of the most engaging stories of today. In this current incarnation of Otogi, Raikoh is back but apparently his powers are not great enough to defend the Earth from the demon hoards, thus, this time around you will have the assistance of four generals who include Tsuna, Sadamitsu, Kintoki, and Suetake who all have a large stake at saving the world of man. Otogi: Immortal Warriors is a fast paced style of a hack and slash game that contains over thirty different levels that all have various objectives to successfully complete. As with all good arcade/action games, the gamer must also fight through a plethora of enemies and of course a variety of boss characters that must be destroyed in order to proceed to the next level. Another interesting thing about Otogi is that almost everything to be destroyed, something very few games have successfully achieved. So when you take out some of the environment in the game, it often can be used to take out some of your enemies as well. The gameplay is still very similar to the original, which is not a bad thing, but is mixed up with the variety of different characters as you play the game. This helps to add some more variety to the game and gives you some different looks on completing levels. All of the characters control somewhat of the same but they all have different specialties that can easily be learned by playing with them. The combo system of Otogi 2 is rather easy to grasp, especially for action-oriented gamers. Most are repeated taps of the B button with the occasional X or Y button. 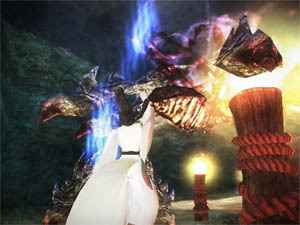 Hit counts can get up in the lofty digits with 40 and 50 hit combos being commonplace on some of the larger enemies. Spells, accessories, and attribute upgrades can be purchased and equipped prior to beginning each stage. While weapons are not shared, spells and accessories are. This helps in stretching the worth of a few upgrades. The method in which the user interface is laid out can make navigation a bit confusing, and the development upgrades are also unintuitive, but these are really minor gripes in the entire scope of things. The only downside to the gameplay of Otogi is the fiddlesome camera angles that sometimes get stuck but fortunately the game has a manual camera override that can really save your hide in dire circumstances. With that being said, this issue doesn't really get in the way of the game as the gameplay fast paced, addictive and beautiful that it's really hard to look at this game and not be impressed. This game may not be the deepest, or the most interesting but it really does give you great hack and slash experiences. 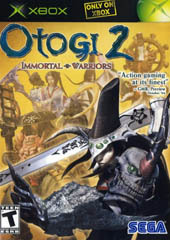 Graphically, Otogi 2: Immortal Warriors is one of the most impressive looking games on the XBox and Sega did an amazing job of creating some of the most realistic looking character models with an extreme amount of detail and colour schemes. The backgrounds are also quite detailed that also contain destructible environment. Musically, Otogi: Immortal Warriors also contains a very Japanese style of soundtrack that matches the feudal area of Japan. Match that with a variety of realistic sound effects and of course the harsh grunts and screams of otherworldly demons and you have a perfect sound game. With that said, Otogi also supports Dolby Digital 5.1 surround for that true arcade experience. In conclusion, Otogi: Immortal Warriors is a very impressive game that contains a wonderfully addictive storyline with some of the best gameplay on the XBox in a long time. With beautiful graphics (and High Definition support), Otogi has truly taken the console to the next generation of gaming and although some parts of the game are repetitive, the designers have ensured that every level has something different so you can be guaranteed to finish this game.